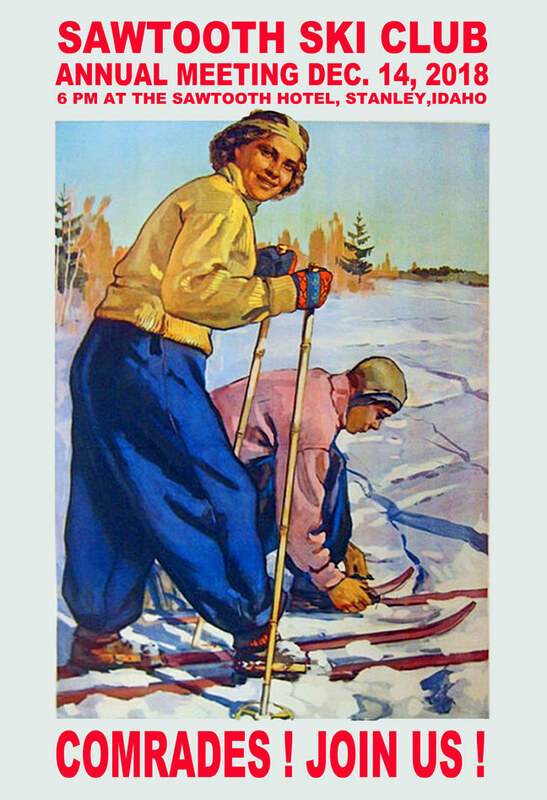 SKI CLUB MEMBERS, LOCAL FOLK, COMRADES ALL … DON’T MISS OUR 19TH ANNUAL SKI PARTY CONGRESS!!! MEET AT THE SAWTOOTH HOTEL IN STANLEY, IDAHO, AT SIX IN THE EVENING ON DECEMBER 14TH, 2018! YOU CAN JOIN OR RENEW YOUR SKI CLUB MEMBERSHIP AT OUR UNBELIEVABLE LOW PRICES! TO THE FUTURE OF CROSS COUNTRY SKIING IN OUR BEAUTIFUL SAWTOOTH MOUNTAINS!